KSSL will host their 5th annual South Plains Honor Flight Radiothon on April 13th from 8 a.m. to 7 p.m. at the Elk's Lodge off 34th Street and Milwaukee Avenue. The radiothon will be from 8:00 a.m. to 7:00 p.m. at the Lubbock Elks Lodge, 3409 Milwaukee Avenue. ROH is a grassroots organization of concerned Lubbock and West Texas area citizens who have a passion for helping our disabled/dysfunctional military veterans and their families. Our members are combat wounded veterans who are dedicated to our country and our veteran community. Stop Soldier Suicide works 1-on-1 with troops, veterans, and military family members to help navigate the maze of services, programs, and assistance available. The mission of the NVW&HC is to establish an environment that is responsive to the needs of veterans and military families using creative therapies and processes that focus on emotional and physical healing. A non-profit organization that helps the needs of individuals and families with special challenges. Offers college-level courses for veterans. Military and veteran programs which allow for families to achieve academic, personal and professional goals. An archive that protects and displays the history of the Vietnam War. The nation's largest wartime veterans service organization. DAV is a nonprofit charity that provides a lifetime of support for veterans of all generations and their families, helping more than 1 million veterans in positive, life-changing ways each year. Task Force Lubbock is an all-volunteer force made up of veterans that want to continue to serve by conducting service projects that benefit the community. Connecting veterans to resources and immediate services that have eluded them at other support centers during their transitions. The Texas Veterans Portal connects veterans, their families, and caregivers to the benefits and services earned through their military service. 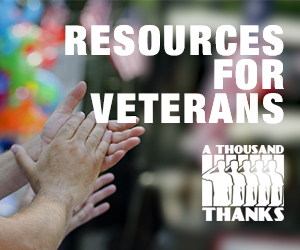 TexVet provides veterans and those in the military with access to information. 2-1-1 Texas, a program of the Texas Health and Human Services Commission, is committed to helping Texas citizens connect with the services they need. Assists veterans under the Texas Veterans Commission. The SBA offers support for veterans as they enter the world of business ownership. Look for funding programs, training, and federal contracting opportunities. Lone Survivor Foundation provides therapeutic retreats for service members and their families affected by Post-Traumatic Stress, mild Traumatic Brain Injury, Chronic Pain and Military Sexual Trauma. Organization that seeks to provide scholarships and financial assistance to children that have lost a parent in the line of duty. Feds Hire Vets is your single site for Federal employment information for Veterans, transitioning military service members, their families, and Federal hiring officials. Since being founded in 2007, Heroes on the Water has been organizing no-expense kayak fishing trips for active-duty military and veterans of the U.S. armed forces and their families. Vet Tix * provides tickets to events which reduce stress, strengthen family bonds, build life-long memories and encourage service members and veterans to stay engaged with local communities and American life. Connects veterans to their community through physical and social activity. Offers programs, services, and events for wounded veterans of the military actions post 9/11. Connects transitioning Marines to education resources, employment opportunities, and other Veterans services that aid in their career and life goals outside of military service. Dedicated to providing urgently needed resources and support for post 9/11 combat wounded, critically ill and catastrophically injured members of the U.S. Armed Forces and their families. Provide sustained, confidential peer support to any veteran, service member, family member, or caregiver whenever they have an issue, wherever they are in the world. The nation’s largest and most inclusive community of post-9/11 veterans. Veterans service organization that has developed a unique expertise on a wide variety of issues involving the special needs of veterans of the armed forces who have experienced spinal cord injury or dysfunction. Confidential call center where combat Veterans and their families can call to talk about their military experience or any other issue they are facing in their readjustment to civilian life. A Public Benefit Corporation (PBC) that creates new, exclusive benefits and discounts for you as active duty, retired military, veteran, guard, reservist, or family member. Code of Support Foundation (COSF) provides critical one-on-one assistance to struggling service members, veterans and their families (SMVF) who have the most complex needs. The Call of Duty Endowment identifies and funds the most efficient and effective organizations that get unemployed veterans back to work. Provides life-improving programs for veterans and military families nationwide to bridge the divide between military life and civilian life. Support the promotion of psychological health, reduce stigma of psychological health concerns and encourage help seeking behavior for service members, veterans and their families. Community-based rehabilitation and recovery programs and important medical and clinical research. We help service-disabled combat veterans re-integrate themselves back into society by providing them with the help they need. Oftentimes that help is a highly skilled and trained service dog. Substance abuse information and support. Our goal is to offer people a single source of relatable, reliable information at any stage of their recovery journey. Financial assistance, food assistance, home repairs, community funding. To foster camaraderie among United States veterans of overseas conflicts. To serve our veterans, the military, and our communities. To advocate on behalf of all veterans.